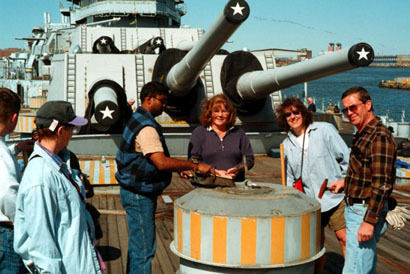 I was onboard the Battleship many times during her restoration working as a volunteer and taking lots of photos whenever I was there. On this page you'll find links to photos taken between April 30th and October 14, 2001 during her year long restoration. If you would like to see photos from another period in the ships long and distinguished career, click Here to go to the Photo Gallery Main Page and select a link for the time period you want to see photos from. If you'd like to see photos of a specific area of the ship, click Here and describe the area in an e-mail. I'll try and take some photos of that area for you the next time I'm onboard.